The Greens say recent welfare cuts in the UK will lead to a rise in people needing these emergency food supplies. “What we want to do is to ensure that welfare benefit payments meet people’s basic needs. We’re here in the sixth richest country in the world and what we’re seeing is more demand for places like this every week. “We’ve got the bedroom tax, council tax benefit cuts, cuts in the Disability Living Allowance. We believe we should have a minimum wage and we should have sufficient benefits and that should be paid for by making sure that rich people and multinationals pay their taxes” she said. Despite a lot of people wondering how long the Green Party could last, it has just celebrated its 40th anniversary, shaking off its tree hugging, eco-warrior image. “We have the same basic principles – a fair society in which everyone has sufficient, within the limits of our one planet” says Ms Bennett. These days you’re more likely to hear about the fight for a living wage than saving the rain forests. Even so, will people struggling to make ends meet automatically think of the Green Party offering them a practical alternative? Ms Bennett does not believe the party is a luxury for easier economic times and denies they are struggling to make their voices heard. She’s a strong advocate of wind power, which she believes will help bring down the cost of energy, despite news that bills will rise to pay for greener electricity. Ms Bennett claims renewable power is vital for the future: “we need that renewable energy”, she says. Norfolk has more Green county councillors than anywhere else in the country and they are keen to improve on that. Tough times put the Greens under pressure and the protest vote appears to moving elsewhere, so these elections will be a significant test for this party that has seen consistent growth for more than a decade in the eastern counties. This entry was posted in Society, UK and tagged bedroom tax, benefits, climate, energy, environment, government, Green Party, Green Party of England & Wales, Greens, multinationals, Natalie Bennett, news, politics, renewables, tax, UK, welfare cuts, wind power on 06/04/2013 by Leon J Williams. 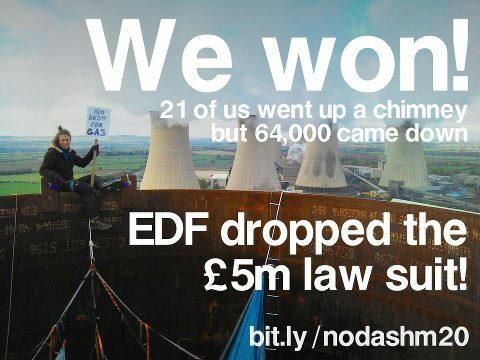 EDF Energy (owned by French company Électricité de France) has dropped its £5m lawsuit against 21 environmental activists. In October 2012 the activists occupied a gas power plant in West Burton (England) for a week before being taken away. Nottinghamshire police have been accused of passing on information on the protesters to EDF Energy. An online petition set up by a parent of one of the protesters got 64,000 signatures in less than a month including prominent people such as Noam Chomsky. Several hundred EDF customers changed energy supplier. This entry was posted in Daily headlines, Environment, UK and tagged activists, Électricité de France, campaigns, Caroline Lucas, EDF, EDF Energy, energy supplier, energy suppliers, environment, environmental activists, Green Party, lawsuit, MP, Noam Chomsky, Nottinghamshire, petition, politics, protesters, West Burton on 14/03/2013 by Leon J Williams. We live in a world where such a thing as vital as water is sold as a commodity, where housing which is fundamental to survival is sold and rented, where basic foods which are needed to survive our sold. These things are basic human needs, and should be freely available to all, but no. One is required to sell their labour hourly and daily to survive, we have to sell ourselves to be able to buy a loaf of bread. But these company owners, they work too, don’t they? No, they do not. They live a life of luxury off our labour, more than we can ever dream of. These people contribute nothing to society, yet take of those who do. All exploited have realised that they are being exploited. The capitalists can not keep up their illusion for long. We have seen their economy, full of contradictions, is built upon quicksand, and is quickly sinking. Recessions are a result of these contradictions inherent in capitalist society, it is a flawed system, thus recessions and depressions will continue to happen. Each time the petit bourgeoisie lose capital, which is accumulate in larger and larger quantities by the bourgeoisie. We have the scraps that the bourgeoisie do not want. Even to live, even to quench our thirst we have to sell ourselves. It is nothing more than barbarianism, when we have to work day in, day out to survive whilst we have scum at the top of society, no better than parasites, about as much use as a virus is to the human body. This entry was posted in Workers and tagged barbarism, business, Capitalism, contradictions, environment, labour, politics, recession, society on 02/03/2013 by Leon J Williams. A study on Chinese soil pollution by Chinas leading environmental watchdog will not be released by the ministry of environmental protection in its entirety. The ministry of environmental protection said that is would not release all the data due to security reasons. Surely a cover for the horrific scale of environmental damage going on in China. China’s official data already exposes huge environmental damage with the groundwater of two thirds of cities marked as severely polluted and two-fifths of rivers are tainted. Last month air pollution in China’s capital Beijing reached hazardous to human health levels as confirmed both by China and the World Health Organisation (WHO). 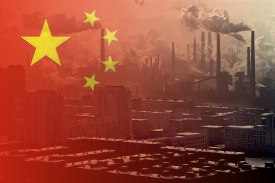 Environmental awareness is rapidly increasing in China and hopefully the latest development will add pressure on the government to do something about it. This entry was posted in China, Daily headlines, Environment and tagged air quality, China, climate, environment, environmental watchdog, health, news, politics, pollution, pollution in china, science, soil, soil pollution, world health organisation on 26/02/2013 by Leon J Williams. Once again big business and and the rich (led by the American right-wing) are trying to distort the reality of climate change. Between 2002 and 2010 $120m has moved from conservative billionaires to over 100 anti-climate thinktanks with the aim of discrediting climate change science. If climate change is indeed part of a natural ebb and flow then why does it need to be discredited? If it is wrong then the science will come to the fore and show that it is not happening or is not caused by human pollution. I would suggest that by funding so much against this that it works to add to the ever mounting evidence that climate change is a reality and that human behaviour is making the situation worse. If these billionaires can successfully discredit climate change then they will be able to effect government policy which in turn will help their respective businesses, either by increasing profits or by avoiding massive losses when people turn away from them. This ‘donation’ is more like a financial investment in their short-sighted views. This entry was posted in Daily headlines, Environment and tagged America, anti-climate change, climate, climate change, climate change science, donation, ebb and flow, environment, human pollution, pollution, science, thinktank on 15/02/2013 by Leon J Williams. GREEN Party leader Natalie Bennett has called for the renationalisation of the nation’s railways, as she backed a campaign to stop rocketing ticket prices forcing people to stay at home – or into cars. 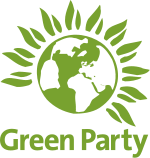 Ms Bennett, who will be taking part in the national Love Trains – Hate High Fares demonstrations this Thursday (Feb 14), said that the Green Party was supporting the campaign to renationalise our railways. She said: “Privatisation has been disastrous for the rail system. It has failed on every possible criteria. Since our rail service was privatised in 1993, some rail journeys, including London to Manchester, the cost of which has risen by 208 per cent, London to Exeter (205 per cent) and London to Cardiff (196 per cent) have increased in price by a rate that dwarfs the increase in the overall cost of living, the Retail Price Index, which has gone up just 66 per cent over the same period. Rail fares in England were famously the most expensive in Europe – in many cases ten times those elsewhere in the EU for journeys of the same distance – even before the Coalition allowed a further increase in January this year, and Ms Bennett called for an end to the failed privatisation experiment. She said: “Renationalisation can help bring prices back down and help people get back on the trains. Private companies’ priority is profit, not services, and they are taking huge profits out of the rail system, at the expense of all of us who use them. “Ticket prices are making it impossible for many to use the trains. It stops families and friends getting together and even stops people taking jobs because the cost of travel is so high. This entry was posted in UK and tagged economy, environment, Green Party, Green Party of England & Wales, Natalie Bennett, nationalisation, politics, privatisation, rail, rail fares, transportation, UK, UK politics on 14/02/2013 by Leon J Williams. The financial cost of cleaning up and sorting out the Sellafield nuclear reprocessing site in Cumbria, England has risen to £67.5bn. In April 2005 radioactive waste leaked out from a cracked pipe into a sump chamber, there has been no environmental damage as a result of this leak. A recent report by The Public Accounts Committee has said that deadlines to clean up the mess have been missed leaving decommissioning projects massively over budget. This is currently costing the UK (tax payer) £1.5bn a year. Such examples will give environmentalists plenty of ammunition in their call to abandon nuclear energy and pursue real investment in renewables. 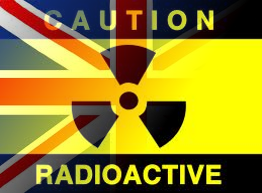 This entry was posted in Daily headlines, Environment, UK and tagged climate, cost of nuclear power, environment, environmental damage, news, nuclear decommissioning, nuclear energy, nuclear plant, nuclear reprocessing, politics, Public Accounts Committee, radioactive leak, renewable energy, Sellafield, UK, UK tax payer on 04/02/2013 by Leon J Williams.